The Scottish Green Party has voted to push for the "progressive use of newly-devolved tax powers". Members at the party's annual conference in Edinburgh called for money raised to be used to protect public services and investment. The motion said a refusal by the Scottish government to make use of all its available powers was unacceptable. It followed Patrick Harvie listing demands the SNP must meet before his party will back its budget next year. 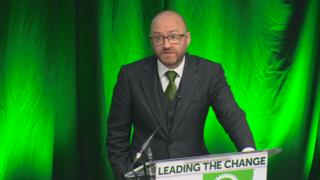 Greens co-convener Mr Harvie called for tax rises for higher earners and tax cuts for lower earners.